I have so many pics of Christmas day that is was hard to choose just a few to post here. So I'm just posting this video right now because it captures so well how Tess reacted the whole day ~ fully engaged with every present! (It took forever for her to open her gifts because every time she opened a new one she wanted to stop and play with it for awhile ~ and I don't blame her!) I was concerned she may become a little overwhelmed with everything so we saved one present for the evening after nap & dinner. 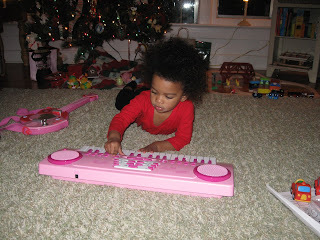 We gave her a wooden train set in the morning which she really enjoyed and we knew she would enjoy this gift also...we just didn't realize she would bust out singing a song that she learned from somewhere ~even if it is just "twinkle twinkle little star" over and over again. Twinkle Twinkle isn't one of the songs we sing a lot so she has picked it up from somewhere...Sesame Street or Sunday School (that's a good combo right?!?) Anyway, she got her guitar which she already had, and was a one woman show! Watch her debut music video by clicking here!